Senang Diri: Land use planning: When MINDEF had to do "National Service"
Land use planning: When MINDEF had to do "National Service"
In land scarce Singapore, even the Ministry of Defence (MINDEF) performs "national service" when it gives up defence land that can be put to better uses. One example is the yet-to-be-opened ITE College Central campus in Ang Mo Kio. It sits on real estate once protected by Singapore Armed Forces (SAF) sentries, high fences and barbed wire but is now an open campus whose sport facilities, NTUC Fairprice supermarket and restaurants have added much value to Ang Mo Kio residents just across the road. More than just four walls and a ceiling, the air-conditioned Internet-enabled classrooms, well-equipped teaching facilities - you can find a Boeing 737 airliner inside, used as a teaching aid for aeronautical engineering students - matched with an open concept design that encourages residents to enliven the campus represents a new paradigm for school facilities that were once dormant after school hours, dead on weekends behind locked gates. The decision to shape ITE College Central the way it is underlines more than just our government's commitment to, and support for, nurturing the next generation of industry professionals. The very existence of the campus on former MINDEF land indicates that space can be reallocated for different national needs within our lifetime, provided we invest in good planning that ensures concurrent and competing demands for living space are weighed carefully. The roughly 10.6 hectares of land taken from the SAF's Amoy Quee Camp to build the ITE has a colourful past. The land formed part of the Republic of Singapore Air Force (RSAF) launch site for Bloodhound Mark II surface-to-air missiles and was once part of Singapore's largest pineapple plantation - run by the SAF. Amoy Quee Camp is still here, just downsized after some defence land was allocated for education purposes. The Bloodhound launch site in Ang Mo Kio, known as Missile Site Bravo, was one of three air force sites armed with missiles that could shoot down hostile aircraft up to 80 km away. 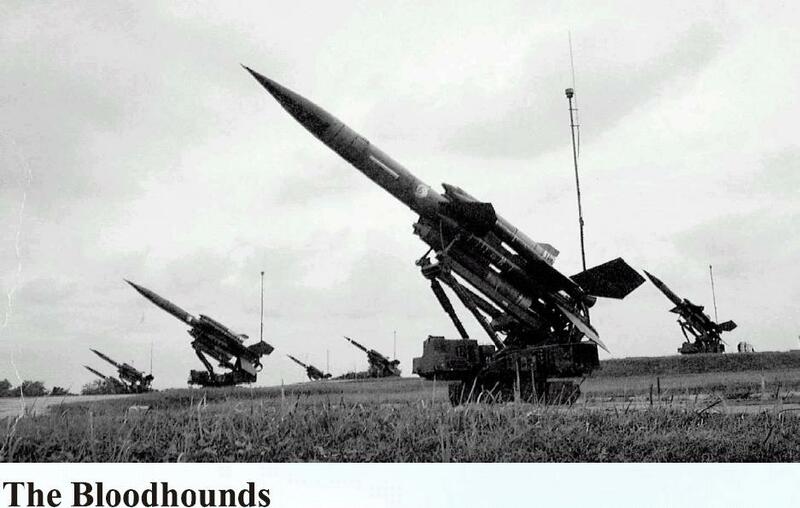 Missile Site Bravo was developed in 1972 when defence planners at the then Ministry of Interior and Defence (now MINDEF) recommended that Bloodhounds be deployed to two other launch sites apart from original Bloodhound base in Seletar. Defence planners reasoned that Singapore should avoid putting all its eggs in one basket at Missile Site Alpha in Seletar, so land was set aside for Missile Sites Bravo in Ang Mo Kio and Charlie in Lim Chu Kang (next to Nanyang Technological University) for our air force to operate and launch some 60 Bloodhound missiles. Seletar was the place where Britain's Royal Air Force deployed all its Bloodhounds before British forces withdrew from Singapore. Bloodhound missile launchers were surrounded by open land several hundred metres from the fenceline. The generous footprint around each missile site was there for a purpose. When launched, each 8.5 metre long Bloodhound was propelled into the air by a pair of ramjet motors and four powerful boost rocket motors which pushed it to twice the speed of sound. The boosters were designed to break away from the missile once their job of getting the missile airborne was done. Vacant land ringed Bloodhound launch pads as you would not want missile boosters, each several metres long, falling onto populated areas. Singapore has always been a small place and it did not take long for someone to suggest better use of that vacant land in the 1970s. Enter Dr Goh Keng Swee, who as Minister of Defence in 1974, suggested that pineapples be grown in SAF camps. Dr Goh's plan was two-fold: the pineapples could be harvested to feed SAF soldiers and the prickly plants could also act as a barrier against intruders. Although Dr Goh is credited for many innovative ideas in post-independent Singapore's formative years, this wasn't one of them. Some 6.5 hectares of Missile Site Bravo was transformed into Singapore's largest pineapple plantation with more than 102,000 Emas Merah and Sarawak pineapple suckers grown there by citizen soldiers who doubled as farmers. Ang Mo Kio continued to be pineapple country till 1981 when manpower difficulties saw the project phased out. Bloodhound missiles served Singapore for 20 years till they were phased out on 1 April 1990. Thanks to astute planning two decades back, the landscape in this corner of Ang Mo Kio has been transformed beyond recognition with Nanyang Polytechnic and now ITE College Central built on part of the RSAF missile base. This year, as more than 10,000 ITE students and more than 1,000 staff move into their advanced learning venue at ITE College Central, few may realise how the campus may not have reached fruition if government departments clung onto historical land use parameters. The seed for the growth of ITE teaching facilities was planted 20 years ago when government planners set their eyes on the future, which is our today. "hi guys we are going to buy first 12 F-35B's ! :-))"
Not quite yet.... maybe... its not official until it is official from Mindef! I disagree with your point that "astute planning two decades back" was done to turn the camp into an ITE campus today. Nobody designed this process. If the old SAF was well planned, they would have used manpower efficiently and not vocated people as "General Duties men" who were used to plant the pineapples and do odd jobs around the camp. Even GKS protected himself from this mistake. He declared that he is not ashamed that mistakes were made in the SAF as it would be astonishing if mistakes were not made. Mistakes were indeed made, but I never once saw him take any blame. I for one don't admire him like some do. He seems to see himself as a god, fit to put up toll gates as he pleases just to make people move to Jurong and order soldiers to undertake whatever tasks he considers necessary in the name of the nation. But I guess he would be all right if he was around today and not pushing for 8 million people, and instead for a population whose native-born sons all served NS equally. At least if his White Horse worked as intended, it would have been fair to those of us whose future generations must risk life and limb for the country. It would be better than Teo CH saying that we protect the foreigners co-incidentally while we undertake the necessary task of protecting ourselves. Why they cannot be asked to share in the burden, he did not elaborate. That was an official endorsement of inequality. It would not be a big leap to say that privileged sons should be spared onerous NS tasks as it is necessary for the nation. For your info some land of and adjoining the old Keat Hong Camp has been used to build the ITE College West and an industrial estate. Re: "Nobody designed this process"
Land parcels do not reallocate themselves. If MINDEF wanted to play the national security argument in its favour, a staff officer could have written a rather persuasive position paper to keep that tract of land for defence uses. Let's give credit where its due when defence land was allocated for education. Re: Dr Goh Keng Swee. Someone who was involved in the draft of this post - a name all of you would instantly recognise - commented that some of his ideas worked, some didn't. Sure, his pineapple plantation idea as a low-cost protection of installation barrier which could also feed soldiers was zany. But on balance, many of his other ideas achieved commendable success. If your definition of leadership means zero defects, then you will be disappointed with what you will see not just in Singapore's military but those elsewhere too. This post was written after ITE College Central hosted a VIP recently and a reader suggested it may be timely reflecting on the history of the land on which the new campus stands. If you're from ITE College Central, you may know who that VIP is. Thank you for sharing your point of view. Enjoy your weekend. I do agree accountability to perfect results do not exist, but accountability to decent means certainly does. Someone involved in the draft of this post may have recognised GKS's mistakes but to public knowledge, GKS never did. GKS was severely lacking here. Would you be interested in hearing how he deigned to listen only to foreign experts and not meritorious local opinion? An SAF coffee table book has him saying that when met with complaints from the first batch of officer cadets (drafted teachers and the like), GKS said that they would do whatever the Israeli instructors said, or they would do double. There is more to this. I can only relay that Israelis assisted in conveying the thoughts of qualified Singaporean officers because GKS would not hear them directly. He lacked a humility that stood as a bad example for other leaders who did not rise entirely through democratic selection. Perhaps democracy was impractical at the time, but this would only have increased the need for innate humility and accountability. If Singaporeans can accept these failings in the name of national urgency, they should be less forgiving of the same lack of accessibility and accountability on today's national issues. The issues will play out over decades and qualified Singaporeans are have weighed in on them. But the standard of accountability from official centres has not changed. You have noted that government actions have lessened Singaporean's C2D with good reason. With apology I would compare your suggestion that the government having its way while maintaining C2D by treating it as a matter of public relations, can only be likened to conditioning Singaporeans to accept a raw deal.